The best bread I’ve had in my life didn’t come from a renowned bakery in town. It didn’t come from a store or a café. It didn’t come from a family’s kitchen. The best bread I’ve had, the one I ate in its entirety on my way home, came from a roadside vendor. I saw her from my backseat window. She was sitting on a tiny bench by the road, under a shady tree. She was with a girl who looked younger than her, may be a sister or a neighbor. She had a large wicker basket by her side overflowing with some sort of fabric and a loaf of bread on top as a sample. My father drove past them then came back to park the car a few feet away from them. As he stepped out of the car and went towards the little girls, I unfastened my belt and jumped on the backseat to peek at them from the rear window. They stood up from their bench when they saw my father. The eldest one might have been eight or nine. Her face was tanned, it was spring; she was wearing a dark printed dress and muddy rain boots. My father must have told her something funny because she started giggling with the other girl and hiding her smile with her scarf. He gave her money, she then kneeled to her basket, unfolded the endless white fabric and handed him, as a nurse would hand a newborn, two dark looking loaves of bread. My father came back to the car, took a slice of the bread and gave me the remaining loaves. I went to my seat and we drove away as the little girls, who were indeed sisters, sat back on the tiny bench giggling and counting their money by the road, under a shady tree. The bread was round and smelled the wood, the trees and the earth. It was dense and light at the same time and had almost a sandy surface. I pinched and ate, then pinched and ate again. I thought about the mother who baked this bread early that morning in her wood-fired oven, I pinched and ate, and about the fig tree in her yard. I thought about her hands kneading the dough, I pinched and ate, about the kisses she put on her daughters forehead before sending them to sell the bread by the road, under the shady tree. I pinched and ate and ate again. 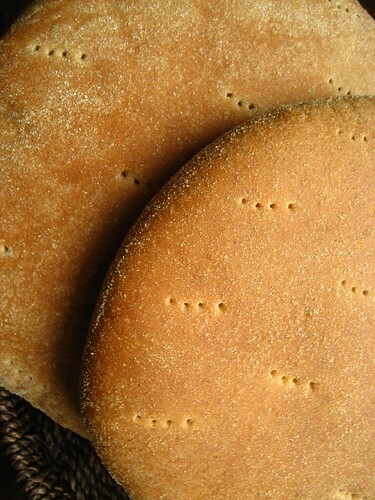 Semolina flour, sometimes called just “semolina”, can be easily found at Italian markets and Middle Eastern markets. 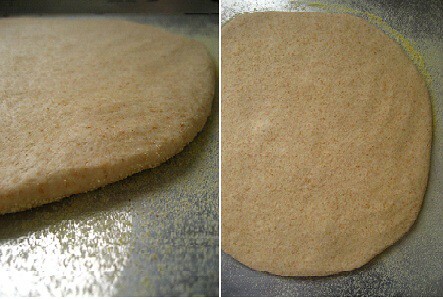 If not available, you can make the bread by using only whole wheat flour and all purpose four (2 cups of each). The texture and color won’t be the same but nonetheless delicious and earthy. Butter two baking sheets and generously sprinkle some semolina flour or cornmeal on top. Set aside. In a small bowl, dissolve the yeast into the tepid water with a tsp of sugar. Let it sit five minutes. In a large bowl, or the bowl of your stand mixer, mix the different flours with salt. 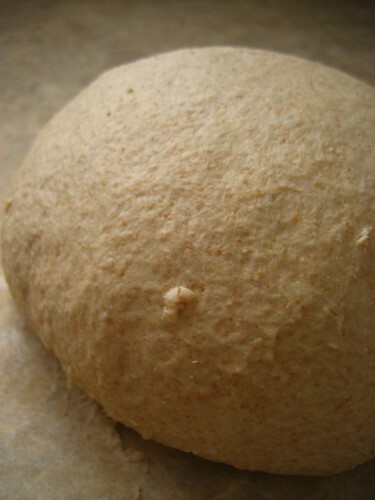 Make a well in the center and add the honey, olive oil, and the yeast mixture. Incorporate the liquid ingredients into the dry ones to form a fairly sticky dough. Knead with the hook attachment for five minutes adding more flour as needed. Or, turn the dough out onto a floured surface and knead, also adding more four as needed, for 10 minutes until the dough feels soft but not sticky and definitely not dry. 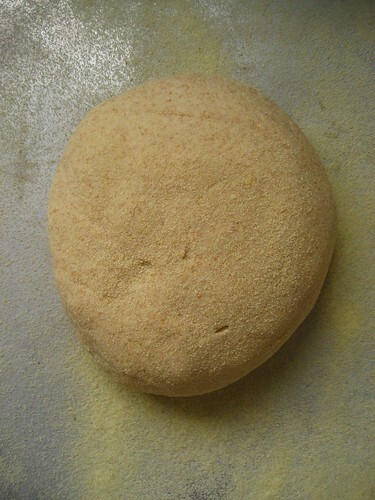 Divide the dough in half, and shape into a small round loaf. 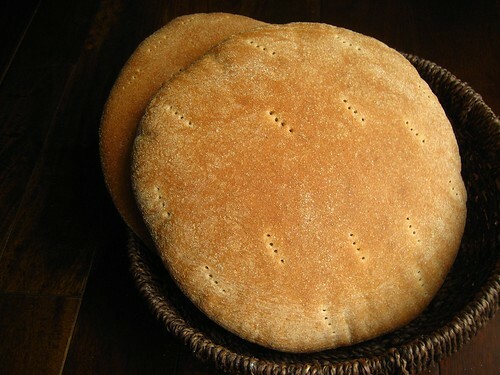 Place each of them onto the prepared pans, dust generously with semolina flour or cornmeal, cover with a towel. Allow to rest for 10 minutes. Poke the dough with a fork in several places. Bake until nicely brown and sound hollow when tapped, between 15 to 20 minutes for each loaf. Transfer the bread to a rack to cool. Beurrer deux toles de caisson et saupoudrer genereusement de semoule fine. Mettre de cote. Dans un petit bol, dissoudre la levure boulangere dans l’eau tiede et une cuillere a café de sucre. Laisser reposer cinq minutes. Dans un grand bol, ou le bol de votre petrin, melanger les deux farines et la semoule fine avec le sel. Mettre un puit au milieu et ajouter le miel, huile d’olive, et le mélange de levure. Incorporer les ingredients liquid aux ingredients secs pour avoir une pate assez colante. Petrir dans le petrin pendant cinq minutes en ajoutant de la farine petit a petit si necessaire. Ou bien, petrir sur un plan de travail en ajoutant de la farine petit a petit, pendant 10 minutes, jusqu’a ce que la pate devienne souple et moins collante. Diviser la pate en deux et faconner- les en deux dome. Mettre chacune d’entre elles sur une les toles preparees. Saupoudrer genereusement de semoule fine, couvrir d’une serviette. Laisser reposer pendant 10 minutes. En utilisant les pomes de vos mains, aplatir chaque dome en un cercle d’une epaisseur d’un centimetre environ. Saupoudrer plus de semoule sur le dessus. Couvrir encore, et laisser lever entre une heure a une heure et demis. Positionner la grille du four au milieu et le prechauffer a 215C. 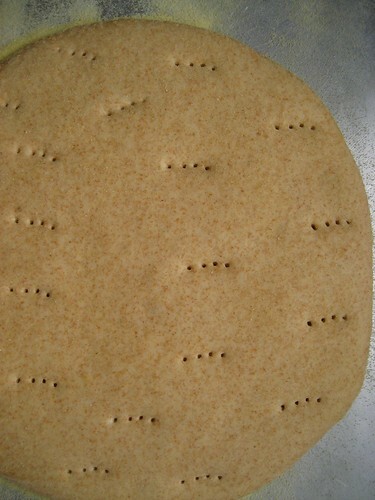 Faire des trous sur la surface des pains a l’aide d’une fourchette. Enfourner et faire cuire jusqu’a ce que le pain devienne bien dore, entre 15 et 20 minutes pour chaque pain. Laisser refroidir sur une grille de patisserie. What a lovely story and an equally lovely loaf of bread! I've never heard of using semolina flour in bread before - is this the same kind of semolina flour one uses to make Italian pastas? If so, I can imagine it might give the bread a wonderfully toothsome quality. Thanks for sharing! - Angi, thank you! Yes, it is the same semolina used to make pasta and you're right it does add a chewy texture to the usually dense whole wheat bread. I simply love it! Quelle belle galette !! t'barik ALLAH! C'est bien de reprendre par çà...très symbolique! Oh , that looks good ! And I expect smells delicious when it's baking , too . C'était déjà un grand plaisir de te relire, Warda.. mais en plus avec un pain!! Un vrai bonheur! Lovely story. I can almost smell the bread. This is a lovely story you have here! And the bread is very beautiful. Oh, my. Lovely story and incredible bread. I tried to not eat the whole loaf, but could not help myself. Thank you. - Mima, alina waalikoum inchaalah! - Smitoniousand sonata, it does! my whole house smell like...home. - Sandra, je sais a uel point tu aimes les bon petits pains, merci! - Zeb, dining tables, Wizzy, thank you all, ladies! - Kimball, you made me laugh! That exactly what happens every time I bake this bread. That's why I make two at a time ;) Glad you like it. Really nice story. I could almost imagine the bread’s smell as I read the story. Great loaf of bread. And I’m sure it was so yummy. Thanks for sharing the recipe. Hello, just came across your blog. Just wanted to say that this was a wonderful post to read. And so is the bread. This bread looks like one of those tempting breads I make with the intention of an amazing sandwich and end up dipping it in olive oil and shoving it in my mouth. One centimeter thickness is more like 1/2 inch, you can also see that in the picture. I made it and it's wonderful! Thank you. A lovely story, charmingly told. The bread is indeed beautiful and I'm sure it must be pretty darn tasty. You have wonderful photos, too! Very nice blog. Beautiful bread and accompanying story. Glad to meet you, Warda. tres bien! j'aime beaucoups! miam miam! Can you break one so we see the inside? Oh. Too late. I bet it was long ago eaten. North African Cuisine - greatly underrated! I want to reach into the screen and pinch and eat your bread. Masha Allah, it's beautiful. Will have to try your Khobz version, iA.